What are your vaccination requirements? To help us maintain the health & safety of all our guests, we recommend that your pet be at least 4 months old to ensure that they have built up the proper immunities following their shots. Prior to arrival you will be required to provide your pet's current rabies certificate as well as their most recent veterinary health certificate with proof of updated shots. We will maintain a copy of your pet’s certificate in your pet’s file. Felines – must be current on their rabies, FVRCP (feline distemper), and feline leukemia vaccines (initially a series of two shots spread out over a 3-4 week time period). Do you have a flea and tick policy? Yes, we request that all pets utilize a vet approved flea & tick application prior to lodging at our facility. 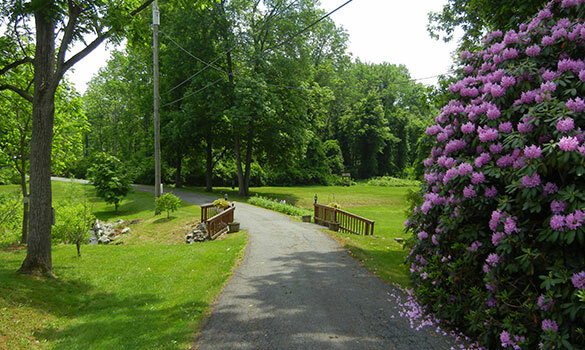 Our yards are treated monthly; however, a nature trail stroll may present opportunities for the unwanted intruders. What is your deposit and cancellation policy? All reservations, whether it is a one night stay or a multiple night stay, will require a $50 deposit per dog and a $25 deposit per cat. A 48-hour notice of cancellation, from 9:00 AM on date of arrival, is required for all reservations. If a reservation is cancelled within the allotted time period all deposits will be refunded. If a 48-hour notice of cancellation is not given, deposits will not be refunded and will act as a late cancellation penalty. Do you offer tours of the retreat? Yes, tours are available. Appointments are not required to take a tour, however, tours are only offered Monday-Thursday between 10:00-12:00 noon or 4:00-6:30 pm. Pets are welcome for a meet & greet in the office but will not be able to tour the retreat with you. Do guests need to be spayed/neutered? No! We do not require that our guests be spayed or neutered, however, it may limit the option of group play with other furry friends.